Truly though the key to spice is balance and that’s what makes these Spicy Smokin’ Chipotle Jalapeño Poppers work. The spice from the chipotle and the jalapeño is calmed down by the cream cheese and the sweet BBQ sauce. For the cream cheese chipotle filling in these jalapeño poppers I simplified things by using a packet of Homemade Gourmet Smokin’ Chipotle Dip Mix (it’s sold in the party dip trio pack) because then the spice level is just right and I don’t have to measure anything. The mix in some cream cheese, cheddar cheese, garlic, and green onions and I’m ready to stuff some peppers and have a party. Note…. When I roast jalapeño poppers in the oven I cook them on wire baking rack set inside a metal sheet pan. Doing this helps get the bacon crispy and drains off the excess bacon grease. Pre-Heat the oven to 400 degrees Using an electric mixer beat together the room temperature cream cheese, the packet of chipotle dip mix, cheddar cheese, green onion, and garlic. Mix until well combined then cover and refrigerate for about 30 minutes to allow the flavors to combine. Meanwhile slice the jalapeños in half lengthwise and with a spoon remove the seeds and ribs. (Wash hands immediately after slicing all the peppers, don’t touch you eyes. Wearing gloves are always a good idea when dealing with peppers.) After you have sliced the peppers fill each pepper with a spoonful of the chipotle cream cheese mixture, wrap each pepper with 1/2 a slice of bacon (not to tight) and secure with a toothpick. Bake the peppers at 400 degrees for 10 minutes then baste the top of the bacon with your favorite BBQ sauce (a slightly sweeter sauce works well with the spicy chipotle mix and the hot peppers). 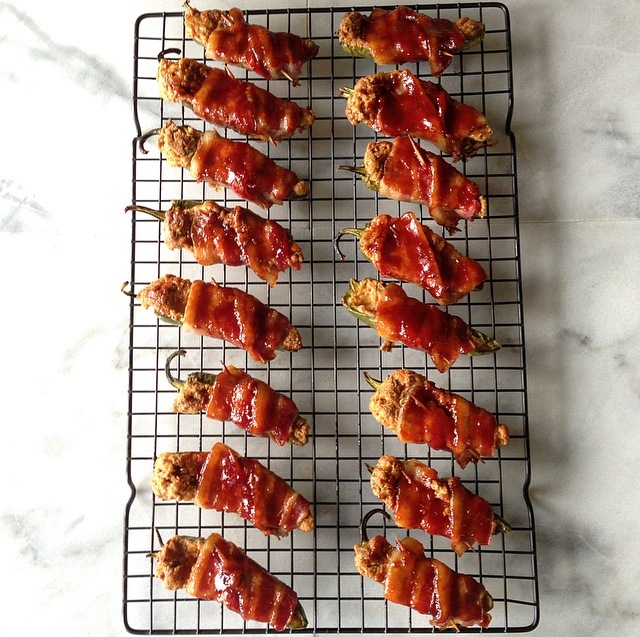 Place the jalapeño poppers back in the oven and continue to bake for another 10 minutes or until the bacon is crisp. Remove the poppers and baste one more time with the sauce and allow the jalapeño poppers to cool. Ohhhhh… Mmyyyyy…. Goodness….. This looks like just about the most delicious thing I’ve ever seen. My husband doesn’t like spicy foods (I do!) so I never make a lot of them because he won’t eat it but I think I HAVE to make these! Thanks Mel 🙂 These have a good kick to them but that’s what makes them so addictive. They would be perfect for one of your Movie nights. Oh and I LOVE Jurassic Park and its one of my go too movies as well!! These would be a perfect movie night snack! It’s such a good, easy watching movie. It’s so well done. Have you seen Jurassic World yet? Yes I saw it on Saturday 🙂 I could never give an unbias review though…. I was glazed over like an excited little kid. I need to see it a few more times to let the excitement wear off. And being a fellow redhead I’ll say…. Only a redhead could out run T-Rex in heels through the jungle!! Haha! I didn’t think about it that way. It all makes sense now! YUM! My family loves spice and these sound delicious! My jalapenos are not ripe yet. When they are since the plants seem to produce about 50 peppers per plant I am definitely making these tasty treats. The cream cheese and spicy pepper combo with the salty bacon sound amazing. Oh these look so amazing!!! Wow Mel, these look fantastic! My jalapeño and Serrano plants have only just started flowering. I’ll have peppers by September at this rate, lol! I hope you are staying high and dry with all that rain down there! Thanks Kathryn! My peppers are in the same boat so to speak…. Just trying to stay above water 🙂 it’s been crazy all the rain we’ve already seen this year. Not normal at all we haven’t even seen any triple digits yet and it’s almost July!! I’m not complaining though. Mel, these look so dayum so good. I’m getting better with spice and I think these will help a lot! Thanks Natalie 🙂 The chipotle adds a nice smokiness too.